Refer to “engine bottom side disassembly” (page 1d- 49). Refer to “engine bottom side assembly” . Inspect the bearing surfaces for any signs of fusion, pitting, burn or flaws. If any, replace them with a specified set of bearings. 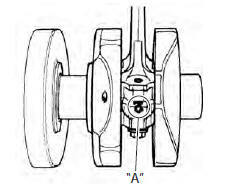 Place the plastigauge axially along the crank pin, avoiding the oil hole, as shown in the figure. Tighten the conrod cap bolts to the specified torque, in two stages. when installing the conrod cap bolts to the crank pin, make sure that i.D code “a” on the conrod faces towards the intake side. Never rotate the crankshaft or conrod when a piece of plastigauge is installed. Remove the conrod cap bolts and measure the width of the compressed plastigauge using the envelope scale. This measurement should be taken at the widest part of the compressed plastigauge. If the oil clearance exceeds the service limit, select the specified bearings from the bearing selection table. Check the corresponding conrod i.D. Code numbers ( or ) “a”. Check the corresponding crank pin o.D. Code numbers (,  or ) “b”. Measure the conrod crank pin o.D. With the special tool. 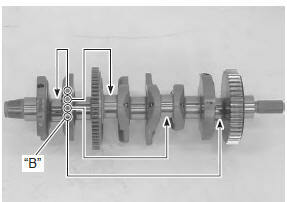 If any of the measurements are out of specification, replace the crankshaft. Select the specified bearings from the bearing selection table. the bearings should be replaced as a set.